In addition to acting, Hart has also hosted various ceremonies. 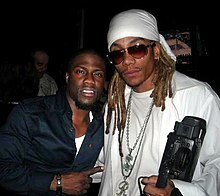 Hart first hosted the 2011 BET Awards. Hart then hosted the 2012 MTV Video Music Awards. His longtime friend Judd Apatow, the director who gave him his first big on-screen break in the TV series Undeclared, was the one who recommended him for the gig. Hart hopes that this will project him further into a side career as an emcee, stating, "Hopefully after MTV, of course we're talking Emmys, Oscars, whatever." He has hosted three episodes of Saturday Night Live. In 2015, Hart hosted the Comedy Central Roast of Justin Bieber. In 2016, Hart co-hosted the 2016 MTV Movie Awards with Dwayne Johnson. 1 2 3 "Death: Nancy Hart, Student Registration". University of Pennsylvania Almanac. 53 (22). February 13, 2007. Archived from the original on March 3, 2016. Retrieved November 7, 2017. 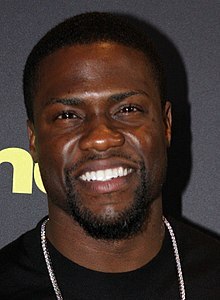 1 2 3 4 "Kevin Hart Biography: Actor, Comedian (1969–)". Biography.com (FYI / A&E Networks. Archived from the original on April 13, 2016. Retrieved November 7, 2017. ↑ "Kevin Hart: The World's 100 Most Influential People". Archived from the original on July 14, 2017. Retrieved November 7, 2017. ↑ Cummings, Jozen. "Career Breakdown: Kevin Hart's Long, Complicated, Hit-and-Miss-and-Hit-Again Path to Stardom". Grantland.com (ESPN) Internet Ventures. Archived from the original on March 11, 2016. Retrieved November 7, 2017. ↑ Itzkoff, Dave (August 30, 2012). "Kevin Hart Learns to Tell the Truth". The New York Times. Archived from the original on August 3, 2017. Retrieved February 27, 2017. ↑ "Kevin Hart: Comically independent". Archived from the original on November 8, 2016. Retrieved November 7, 2016. ↑ "Kevin Hart returns to Community College of Philadelphia: "I don't got no student loans!"". Billypenn.com. December 9, 2014. Archived from the original on August 3, 2018. Retrieved January 6, 2019. 1 2 3 Johnson, Keosha. "TheGrio's 100: Kevin Hart, Philly comedian sees the humor in life experiences". TheGrio.com. Archived from the original on October 29, 2015. Retrieved November 7, 2017. ↑ "About Kevin Hart". Comedy Central. Archived from the original on October 6, 2012. Retrieved October 18, 2012. 1 2 3 4 5 Itzkoff, Dave (October 18, 2012). "Life Sends Lemons? Make Comedy". The New York Times. Archived from the original on June 14, 2016. Retrieved October 18, 2012. 1 2 Gomez, Luis (October 18, 2012). "Interview: Kevin Hart not shy about past flubs". Chicago Tribune. Archived from the original on March 3, 2016. Retrieved November 7, 2017. ↑ "About Kevin Hart". Comedy Central. Archived from the original on October 6, 2012. Retrieved November 7, 2017. ↑ Puig, Claudia (July 2, 2013). "Kevin Hart's 'Let Me Explain' is too heavy on the 'me'". USA Today. Archived from the original on August 28, 2017. Retrieved November 7, 2017. ↑ Dave McNary (May 6, 2015). "'Kevin Hart: What Now' Release Date Set for Oct. 14, 2016". Variety. Archived from the original on October 4, 2015. Retrieved September 4, 2015. ↑ "Kevin Hart To Make History When He Headlines Lincoln Financial Field « CBS Philly". Philadelphia.cbslocal.com. February 16, 2015. Archived from the original on September 7, 2015. Retrieved September 4, 2015. ↑ Kevin Hart: WHAT NOW TOUR (August 30, 2015). "Kevin Hart: WHAT NOW TOUR at Lincoln Financial Field on Sun Aug 30, 2015 8:00 PM EDT — Live Nation". Livenation.com. Archived from the original on March 4, 2016. Retrieved September 4, 2015. ↑ "Kevin Hart Won't Play A Gay Role Because 'Of What People Are Going To Think' | HuffPost". Huffingtonpost.com. Archived from the original on December 22, 2016. Retrieved January 6, 2019. ↑ Fleming Jr, Mike (July 11, 2012). "'Ride Along' Detours To Universal As Kevin Hart And Ice Cube Vehicle". Deadline Hollywood. Archived from the original on May 29, 2014. Retrieved November 7, 2017. ↑ "Ride Along". Rotten Tomatoes. Flixster. Archived from the original on November 26, 2017. Retrieved November 7, 2017. ↑ "Weekend Box Office Results for January 17-20, 2014". Box Office Mojo. Archived from the original on February 24, 2014. Retrieved February 19, 2014. ↑ Fleming Jr, Mike (April 23, 2013). "Sequels On Tap For 'The Heat' And 'Ride Along'". Deadline Hollywood. Archived from the original on June 19, 2014. Retrieved November 7, 2017. ↑ Kroll, Justin (March 13, 2014). "'Ride Along 2' to Bow on Martin Luther King Weekend 2016". Variety. Archived from the original on August 5, 2017. Retrieved November 7, 2017. ↑ Berkshire, Geoff. "BET's 'Real Husbands of Hollywood' with Nick Cannon, 'Second Generation Wayans' get January premieres". zap2it. Archived from the original on January 2, 2013. Retrieved November 7, 2017. 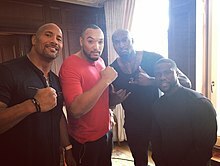 ↑ "Dwayne Johnson and Kevin Hart spotted filming 'Central Intelligence' in Massachusetts". onlocationvacations.com. May 5, 2015. Archived from the original on May 6, 2015. Retrieved May 6, 2015. ↑ Mike Fleming Jr. "Louis C.K., Eric Stonestreet & Kevin Hart To Voice Animated 'Pets' Movie – Deadline". Deadline Hollywood. Archived from the original on October 31, 2014. Retrieved January 19, 2015. ↑ DreamWorks Animation (January 21, 2014). "Captain Underpants Saves The Day By Recruiting Top Comedy Talent To Voice New DreamWorks Animation Film" (Press release). PR Newswire. Archived from the original on January 22, 2014. Retrieved January 22, 2014. ↑ Kroll, Justin (April 15, 2016). "Kevin Hart, Dwayne Johnson Circling 'Jumanji' Reimagining". Variety. Penske Business Media. Archived from the original on April 24, 2016. Retrieved April 25, 2016. ↑ Pedersen, Erik (April 14, 2017). "'Night School' Release Date: Kevin Hart Comedy Set For Fall 2018 From Universal". Deadline Hollywood. Archived from the original on September 11, 2017. Retrieved September 16, 2017. ↑ Otterson, Joe (October 11, 2018). "Kevin Hart Inks First-Look Deal With Nickelodeon (EXCLUSIVE)". Variety. Penske Business Media. Archived from the original on October 24, 2018. Retrieved October 11, 2018. ↑ Kevin Jagernauth (October 1, 2014). "Casting: Colin Firth & Kevin Hart Are 'Intouchables', Quv". The Playlist. Archived from the original on May 2, 2016. Retrieved May 5, 2016. ↑ Fleming Jr., Mike (April 25, 2018). "Harrison Ford Takes First Animated Role, In Illumination's 'The Secret Life Of Pets 2'". Deadline. Archived from the original on April 25, 2018. Retrieved April 25, 2018. ↑ Harp, Justin (April 24, 2018). "Dwayne Johnson's Jumanji: Welcome to the Jungle sequel drops first teaser as US release date is confirmed". Digital Spy. ↑ Kit, Borys (October 26, 2016). "Kevin Hart in Talks to Play Santa Claus in Disney's 'Dashing Through the Snow' (Exclusive)". The Hollywood Reporter. Archived from the original on November 8, 2017. Retrieved November 7, 2017. ↑ Coggan, Devan (October 26, 2016). "Kevin Hart to play Santa in Disney comedy Dashing Through the Snow". Entertainment Weekly. Archived from the original on November 8, 2017. Retrieved November 7, 2017. ↑ Mike Fleming Jr (October 26, 2018). "Chris Rock To Direct Kevin Hart In Will Packer-Produced Universal Comedy 'Co-Parenting'". Deadline Hollywood. Archived from the original on October 26, 2018. Retrieved October 28, 2018. ↑ Bark, Theo (June 8, 2011). "Patti LaBelle to Receive BET's Lifetime Achievement Award". TheBoombox.com (AOL). Archived from the original on March 19, 2012. Retrieved November 7, 2017. ↑ Montgomery, James (May 15, 2012). "2012 Video Music Awards To Take Over Staples Center Show will air live from Los Angeles on Thursday, September 6, at 8 p.m. ET/PT". MTV News. Archived from the original on May 16, 2013. Retrieved November 7, 2017. ↑ Weiner, Jonah (May 31, 2012). "VMA 2012 Host Kevin Hart Is Judd Apatow's Favorite Vertically Challenged Comic". Rolling Stone (Rolling Stone's Big Issue). Archived from the original on August 18, 2017. Retrieved September 2, 2017. ↑ Kondolojy, Amanda (March 3, 2013). "'Saturday Night Live' With Kevin Hart and Macklemore & Ryan Lewis Up From Last New Episode". TV by the Numbers. Archived from the original on March 5, 2016. Retrieved November 7, 2017. ↑ Kondolojy, Amanda (January 18, 2015). "'Saturday Night Live' With Host Kevin Hart and Musical Guest Sia Flat With Last Original". TV by the Numbers. Archived from the original on March 5, 2016. Retrieved November 7, 2017. ↑ Zumberge, Marianne (March 5, 2015). "Comedy Central's Justin Bieber Roasters to Include Snoop Dogg, Martha Stewart". Variety. Archived from the original on November 8, 2017. Retrieved November 7, 2017. ↑ Dwayne Johnson and Kevin Hart to Host the 2016 MTV Movie Awards Archived July 6, 2018, at the Wayback Machine Comingsoon.net Retrieved February 23, 2016. ↑ Dessem, Matthew (December 4, 2018). "Kevin Hart Will Host the 2019 Academy Awards". Slate. Archived from the original on December 5, 2018. Retrieved December 4, 2018. ↑ Visser, Nick (December 7, 2018). "Kevin Hart Says He's Stepped Down From Oscar Hosting Gig Amid Controversy Over Old Tweets". Huffington Post. Archived from the original on December 7, 2018. Retrieved December 7, 2018. ↑ Blackmon, Michael (December 6, 2018). "Kevin Hart Is Deleting Old Anti-Gay Tweets After Being Announced As Oscars Host". BuzzfeedNews. Archived from the original on December 11, 2018. Retrieved December 12, 2018. ↑ Donnelly, Matt (December 6, 2018). "Kevin Hart Responds to Old Homophobic Tweets: 'I'm in Love With The Man That I Am Becoming'". Variety. Archived from the original on December 15, 2018. Retrieved December 12, 2018. ↑ "Kevin Hart steps down from hosting Oscars to avoid 'distraction', apologizes to the LGBTQ community". EW.com. Archived from the original on December 7, 2018. Retrieved December 7, 2018. ↑ News, A. B. C. (January 4, 2019). "Kevin Hart rethinking quitting Oscars after 'raw' Ellen interview". ABC News. Archived from the original on January 4, 2019. Retrieved January 4, 2019. ↑ "Stream Kevin 'Chocolate Droppa' Hart's 'What Now? (The Mixtape)'". Rap-Up. October 14, 2016. Archived from the original on August 28, 2017. Retrieved November 7, 2017. ↑ Goddard, Kevin (September 30, 2016). "Kevin Hart signs to Motown records". Hotnewhiphop. Archived from the original on September 4, 2017. Retrieved November 7, 2017. ↑ "How Kevin Hart Became an Unexpected Underwear Model (Exclusive)". Entertainment Tonight. November 6, 2017. Archived from the original on November 8, 2017. Retrieved November 7, 2017. ↑ McCarthy, Sean L. (January 16, 2013). "5 Comedians Who Inspired Kevin Hart, In His Own Words". TheComicsComic.com. Archived from the original on November 8, 2017. Retrieved November 8, 2017. ↑ Kevin Hart [@KevinHart4real] (March 24, 2017). "Richard Pryor...Eddie Murphy....Dave Chapelle" (Tweet). Retrieved February 15, 2018 – via Twitter. ↑ Landrum, Jonathan (September 9, 2011). "Kevin Hart Pokes Fun at His Life in Standup Movie". Backstage. Archived from the original on November 8, 2017. Retrieved November 7, 2017. ↑ "Kevin Hart Divorce: Talks Split On 'The Rosie Show'". HuffPost. January 20, 2012. Archived from the original on October 20, 2016. Retrieved November 7, 2017. ↑ Sangweni, Yolanda (February 3, 2014). "Photo Fab: Kevin Hart Takes Daughter to First Father-Daughter Dance". Essence. Archived from the original on November 8, 2017. Retrieved November 7, 2017. ↑ "Kevin Hart: I'm Divorced, And Still Rich!". TMZ.com. March 22, 2013. Archived from the original on November 8, 2017. Retrieved November 7, 2017. ↑ "Kevin Hart Engaged to Eniko Parrish – Watch the Sweet Proposal". People. Archived from the original on October 3, 2016. Retrieved November 7, 2017. ↑ Fisher, Kendall; Kitnick, Sara (August 15, 2016). "Kevin Hart Marries Eniko Parrish: Get the Details About Their Big Day". E! News. Archived from the original on November 13, 2017. Retrieved November 7, 2017. ↑ Petit, Stephanie (November 21, 2017). "Kevin Hart and Wife Eniko Welcome Son Kenzo". People.com. Archived from the original on November 21, 2017. Retrieved November 22, 2017. ↑ France, Lisa Respers (December 15, 2017). "Kevin Hart spills about cheating on pregnant wife". CNN. Archived from the original on January 11, 2018. Retrieved January 16, 2018. ↑ O'Malley Greenburg, Zack (June 12, 2017). "Full List: The World's Highest-Paid Celebrities 2017". Forbes. Archived from the original on December 1, 2017. Retrieved November 27, 2017. ↑ "Drunken driving arrest a 'wake-up' call, comedian Kevin Hart says". CNN. April 15, 2013. Archived from the original on August 19, 2017. Retrieved November 7, 2017. ↑ "Comedian Kevin Hart Pleads No Contest To DUI". CBS Los Angeles. August 5, 2013. Archived from the original on December 22, 2013. Retrieved November 7, 2017. Wikimedia Commons has media related to Kevin Hart.